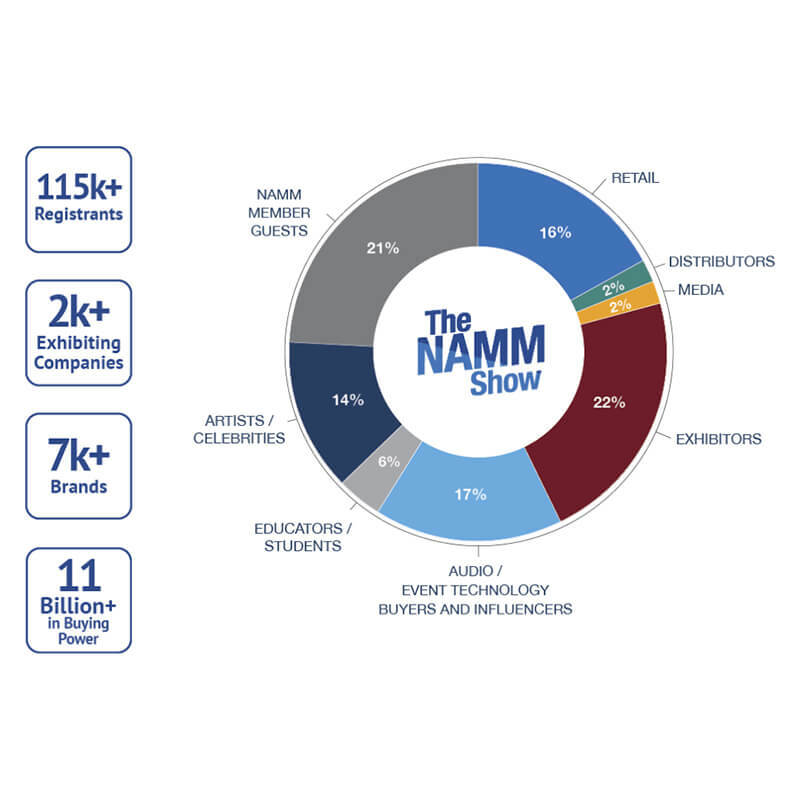 The NAMM Show is the global crossroads of the music, sound and event technology products industries, with more than 115,000 registrants from 130 countries and regions commanding $11+ billion in buying power. Attract buyers, influencers and media companies from every segment in the industry. A true global gathering, with qualified buyers attending from 130 countries and regions. Collectively, the buying audience at The NAMM Show yields an estimated $11 billion in annual purchases. Sell to thousands of buying firms and purchasing influencers. Utilizing NAMM's platform allows exhibitors to extend their brand messages and target customers through social media. An international base of buyers and influencers connect at The NAMM Show, helping brands go multi-national in one convenient location. 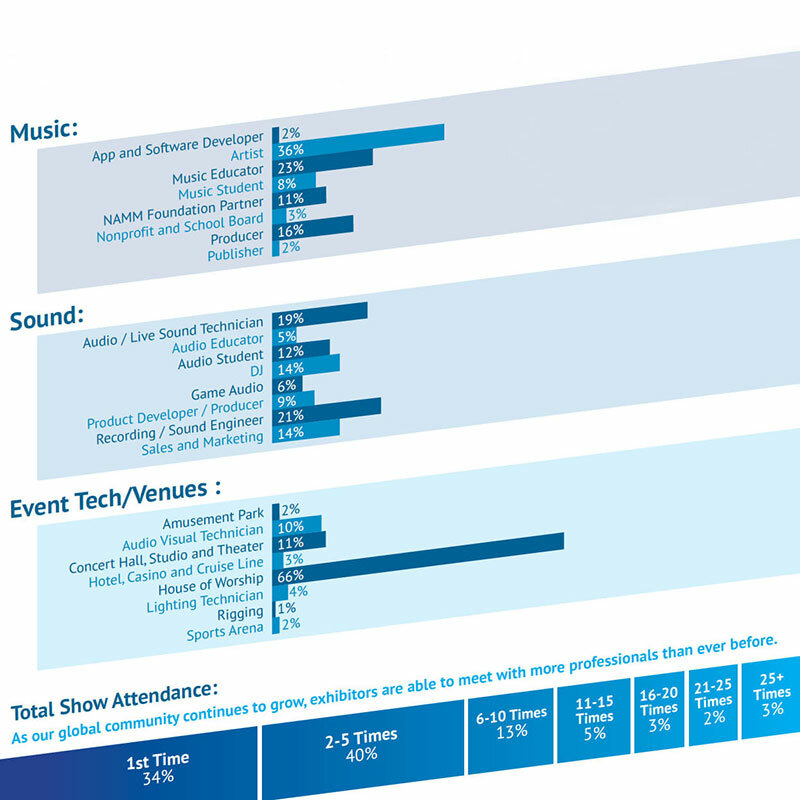 A record number of professionals, representing NAMM members and other influencers, created a diverse buying base from multiple industry segments. The audience commanded billions in buying power and created power sales opportunities for exhibiting members. The 2019 NAMM Show welcomed thousands of influencers from all aspects of music, sound and live event production. An international base of buyers and influencers connected at The NAMM Show, helping brands go multi-national in one convenient location. The NAMM Show gathers the most powerful buyers and leaders in the music products, pro audio and live event technology industries. Below are examples of attendees that attend the show. For more than 100 years, The NAMM Show has showcased an immense range of products, from component manufacturers and School Band and Orchestra to the latest in fretted instruments, pianos, percussion and synthesizers. Quinlan & Fabish Music Co.
International manufacturers, distributors and dealers discovered the latest technologies and networked with key players, spanning the continents and marketplace. Businesses saved on opportunity and travel costs by consolidating their global outreach into our industry's family reunion in sunny Southern California. With January dates and proximity to the powerful Los Angeles touring community, pro audio and live sound leaders united to evaluate products and exchange ideas. Events like the 34th Annual NAMM TEC Awards, the return of AES @ NAMM, TEC Tracks education and a variety of meet-ups helped draw studio and live sound professionals from every facet of the industry. At the Crossroads, all aspects of performance and production are showcased, including a wide array of lighting, staging and other event technologies. Collaborations with ESTA and the return of the Parnelli Awards helped attract a power mix of theme parks, rental houses, installers, production companies, lighting designers and more. Xi-an NovaStar Tech Co. Ltd.
With a range of products and new ideas on display, the show attracts powerful venues that come to evaluate the latest material and develop relationships with their brand partners. A strong worship base in California and the American southwest brings hundreds of facilities looking for cutting-edge audio, A/V and event solutions to create a production worthy of their message. Events such as the NAMM Night Worship sponsored by Yamaha and TEC Tracks education sessions for House of Worship round out the buying mix. Administrators and faculty utilize The NAMM Show to find the right set-up for their performing arts centers and community needs. With NAMM's dedicated community areas, buyers can easily find your products. See who else exhibits at the show by viewing the show map. Exhibitors benefit from reaching a wide range of media groups with new product, artist, brand news and activations. No other trade show attracts an international media base like The NAMM Show, which draws more than 1,700 major TV, radio, newspaper and digital media outlets. Over 2.17 billion social media impressions gave exhibitors the opportunity to utilize NAMM's platform to extend their brand message to target customers. Exhibiting at the show contributes funds back into the industry to support market growth. Learn more on how exhibiting at The NAMM Show can help grow your brand.